Jared has been given a private jet to fly and visit his father, but the plane crashes in a remote area of Canada. Jared is rescued by Kyle, a Cree Indian about his age. Kyle is not impressed with spoiled, rich Jared. When Jared insists that the two boys go up a hill that is considered off-limits, their lives are turned upside-down when they find themselves in another dimension! Great read! Jared's plane has crashed in the Alberta wilderness, and Kyle is first on the scene. When Jared insists on hiking up the highest hill in search of cell phone reception, Kyle hesitates; his Cree grandmother has always forbidden him to go near it. There's no stopping Jared, though, so Kyle reluctantly follows. After a night spent on the hilltop--with no cell service--the teens discover something odd: the plane has disappeared. Nothing in the forest surrounding them seems right. In fact, things seem very wrong. And worst of all, something is hunting them. 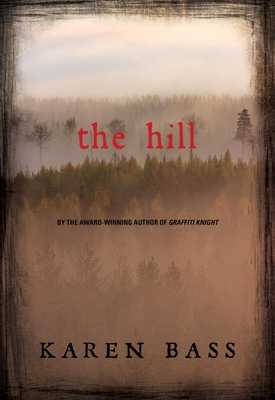 Karen Bass, the multi-award-winning author of Graffiti Knight and Uncertain Soldier, brings her signature action packed style to a chilling new subject: the Cree W htiko legend. Inspired by the real story of a remote plane crash and by the legends of her Cree friends and neighbours, Karen brings eerie life--or perhaps something other than life--to the northern Alberta landscape in The Hill.